Summary: It’s 1969 and the country is gearing up for what looks to be the most exciting moment in U.S. history: men landing on the moon. Ten-year-old Mamie’s class is given an assignment to write letters to the astronauts. All the girls write to Neil Armstrong (“So cute!”) and all the boys write to Buzz Aldrin (“So cool!”). Only Mamie writes to Michael Collins, the astronaut who will come so close but never achieve everyone else’s dream of walking on the moon, because he is the one who must stay with the ship. After school ends, Mamie keeps writing to Michael Collins, taking comfort in telling someone about what’s going on with her family as, one by one, they leave the house thinking that someone else is taking care of her—until she is all alone except for her cat and her best friend, Buster. And as the date of the launch nears, Mamie can’t help but wonder: Does no one stay with the ship anymore? 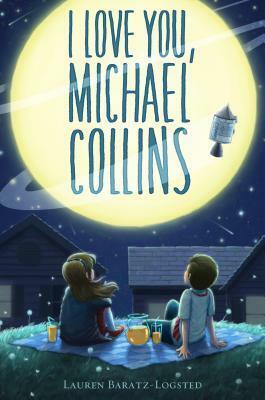 I Love You, Michael Collins was a Best Book of June 2017 on Amazon; a semifinalist for the Goodreads Readers’ Choice Awards; and a pick by the Planetary Society for Best Science Children’s Books of 2017.
Review: There is so much I really enjoyed about this book! First, I adored looking into the experience of the moon landing. I cannot even imagine witnessing it happening! What an amazing feat it was and completely unimaginable. (And I hope to at some point see it happen again.) And I thought Baratz-Logsted did a good job showing all the different types of feelings towards the moon landing and space program. But I’m glad that she focused on its amazingness and the excitement. Second, I think the author did a fantastic job with the character’s voice. With a book of letters it is essential that the writing sounds like the character because it is actually the character writing all the words. I loved seeing all the techniques she used to write like Mamie while still keeping her writing to a literary level. Third, I loved that the book was not just a reenactment of the moon landing and a family’s celebration of it. The story has so many layers within it: Mamie’s introverted personality and the look into what makes a kid like this happy; her family’s conflicts and issues; and the power of one best friend. Overall, I Love You, Michael Collins is a fun historical fiction middle grade book that is perfect for so many readers! Teachers’ Tools for Navigation: The first thing I went to when I thought about this book from a teachers point of view was the idea of letter writing. Mamie writes Michael Collins originally because it is a school project. Mamies letters could be used as a starting point on how to write letters, parts of a letter, etc. And students could even write a letter to someone in the news that is doing something amazing. Next summer is the 50th anniversary of the moon landing, and at the end of next school year, I am definitely going to do a cross-curricular unit about NASA and the Apollo missions along with a read aloud of excerpts from this novel. It is so engaging as a story and will also be a great way for students in the 21st century to have a window into the 1960s. But even without this amazing anniversary, Baratz-Logsted’s title is one that middle grade students will find enjoyment in and should definitely be in classrooms and libraries! How did the author help make her writing seem like a ten-year-old was writing the letters? Michael Collins is not a household name like Buzz Aldrin and Neil Armstrong. Why is that? Do you think we should all know his name in the same context as the other two astronauts? Which character do you think changed the most throughout the book? What do you think is going to happen next with Mamie’s family? How did Buster’s friendship help Mamie keep her positivity and sanity during this tough time in her family? If you were going to have a moon landing party, what would you make? How would the story of Mamie’s parents’ separation have been different in the 21st century? I finally figured out why you never write back. Can you figure out how I figured this out? If not, I will tell you. I did the math. Okay, I didn’t really do the math, since I don’t have all the information. But it struck me that I might not be the only person writing to you. I though, if every school in the country has just one class that is writing letters to the astronauts and if in each class there is just one kid like me writing to you, then that is still a lot of mail. It’s no wonder you can’t write back to everyone. And of course you do have other things to do right now. I’m not sure how I feel about the idea of you getting more mail than I originally thought you did. On the one hand, I’m really happy for you. I’m glad you’ve got more than just me. On the other hand, it was kind of nice when I thought I was the only one. It felt special. Like I was the the only one who knew about you. Which of course isn’t true. The whole world knows about you. It’s just that most of them don’t seem to appreciate you very much. I read this book and enjoyed it very much. Loved, loved, loved this book! So much authenticity! I will definitely be reading it to my class this year and telling them ALL about my childhood! I watched the landing with my folks on a black and white TV with a window unit air conditioner cooling the room. The characters in the book are so relatable. Thank you for this new gem!